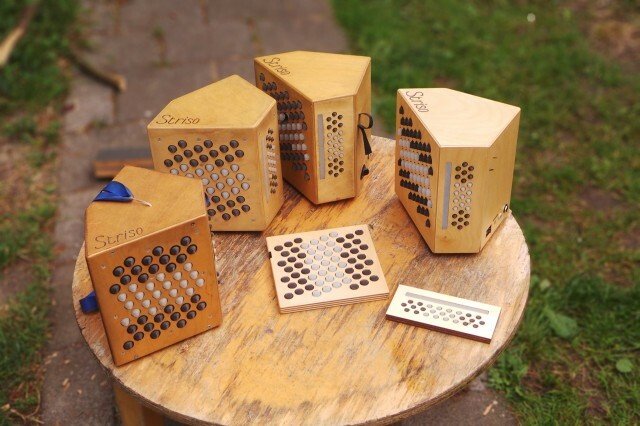 The Striso is a new intuitive, expressive and portable instrument, currently being developed by Piers Titus van der Torren. Read more about the Striso. 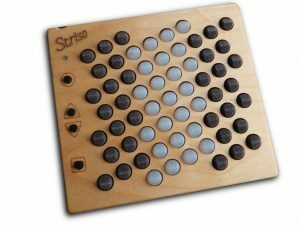 A new Striso board is out in the world! This time with some extra buttons for portamento, transposing, and settings. 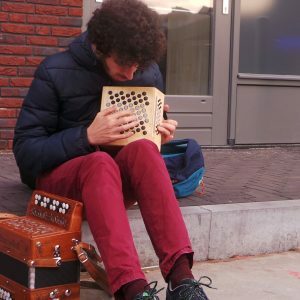 Its new owner Leopold Solter has put some videos on his Vimeo channel of him playing with it, mostly in combination with the Axoloti, a versatile open source hardware synthesizer. More videos of the Strisoboard can be found on the YouTube channel of Matthew Tyas, who owns the previous version, and uses it in combination with Axoloti and ipad. The latest Striso prototype got lost last weekend in Amsterdam! If it somehow happens to be played by you (or near you) I’d love to hear about your musical adventures! Please contact me at pierstitus@striso.org. Please take good care of it and make a lot of music, or pass it on to someone you think deserves to be playing this magical instrument! 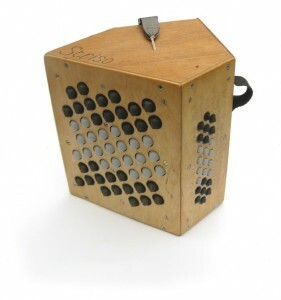 The weekend of November 4th-5th I’ll be in Zaragoza, Spain, to demonstrate the Striso during the Radical dB showcase of new music instruments and interfaces. See the Etopia website for details (in Spanish). A fourth Striso prototype is added to the family! It has lots of small and big improvements, better wood, better finish, better electronics, improved sensor stability and some smaller design improvements. Also I made a flat USB controller with the same button board for use as a multitimbral Midi/OSC controller. The quality finally is getting good enough for me to start building a small series for selling or renting out to first early adopters. Please fill in the contact form if you’re interested! From left to right the first till fourth Striso prototype, in the middle a USB controller based on the same button field. Or at least it’s note layout. Besides the three working Striso prototypes and my modified accordion I decided to add another way to discover the beauty of the note layout: in the shape of an overlay for the Sensel Morph, a big multitouch pressure sensitive touchpad which makes it easy to develop your own pressure sensitive instruments or other interfaces. See the Sensel blogpost. On my side it’s not silent either, currently I’m in a big rush to build a small batch of Striso’s, so finally possibilities for buying or renting a Striso are at the horizon. In this batch there are many seemingly small but important improvements over the last prototype. Button sensor improvements, new amplifier, stronger processor, body construction tweaks and increased overall robustness due to the completely redesigned and more integrated electronics. The first week of July I will present the Striso on the NIME conference in London. For more information see www.nime2014.org. I’ll be presenting on Thursday, and also give a demonstration on Wednesday. And if you happen to be in London but not at NIME, you might consider coming to the open day on Friday.